All I wanted was a doorbell that would send me a text message when somebody rang it, and I wanted it NOW. There are a number of ways I could have done this. Ideally I would have used an opto isoloator, but Radioshack didn't have those. They did have a full wave bridge rectifier, and a 5V relay. 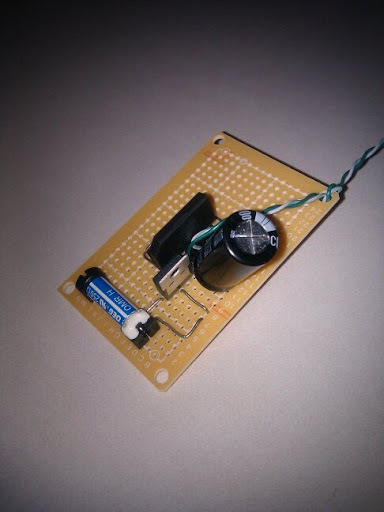 I already had some random capacitors, and a 5V regulator, so that would have to do. I connected the AC inputs on the rectifier inline with the doorbell using the connections behind the doorbell transformer in my garage. The relay switch is connected to the digital input and ground connections on my IOBridge. I've configured the iobridge to send an email to both my magic account at ping.fm that updates twitter, as well as an email distribution list that sends text messages to both my wife and myself, as well as to our email inboxes. Neat project! I would however, add more filtering caps on the output. Also, adding a reversed biased diode on the relay coil is always advised. It might be ok to go without but I wouldn't. I also wouldnt worry about the optoisolator. In many cases they are necessary but I think they get over rated as required too often. That is bad as hell. BTW, I'm also Jason Garland and you made me look way smarter than I am. Thank you.